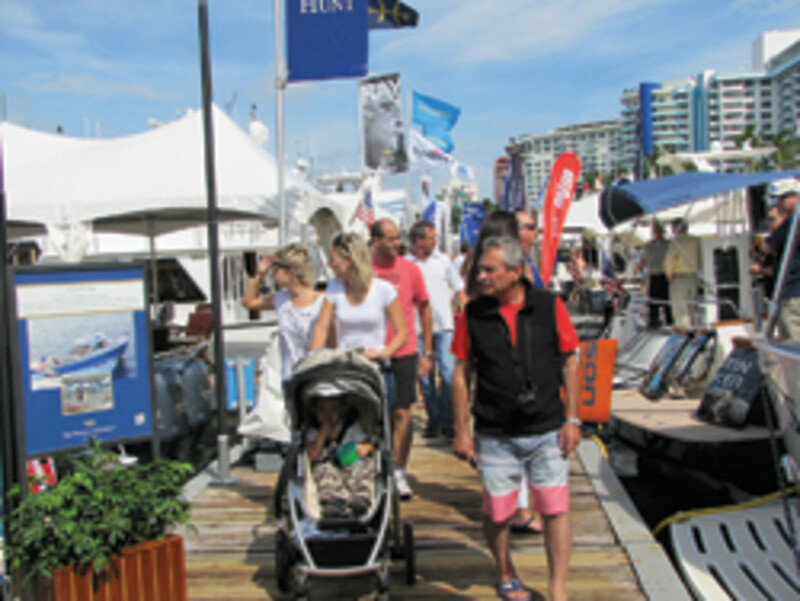 The largest-ever Yacht & Brokerage Show in Miami Beach featured more than 500 new and used boats valued at more than $1 billion this year, with the in-water count up 16 percent from 2012, according to Show Management, producers of the show held Feb. 14-18. The largest increase, 58 percent, came in the 105- to 125-foot category, requiring the show to expand its footprint on Indian Creek. The 80- to 104-foot category saw an increase of 31 percent from 2012, and boats under 49 feet were up 23 percent. The show is owned by the Florida Yacht Brokers Association and runs concurrently with the NMMA Miami International Boat Show. Because there’s no entry fee it’s difficult to track attendance, but exhibitors overwhelmingly say the event was exponentially better than last year’s show, with some proclaiming it the best show of the season. Viking Yachts had positive feedback to report, with eight boats sold during the show — a 76 Enclosed Bridge Convertible, a 70 Convertible, five 62 Convertibles and a 42 Open. “From the show, we also are working another six to 10 strong prospects,” says Viking Yachts communications director Peter Frederiksen. 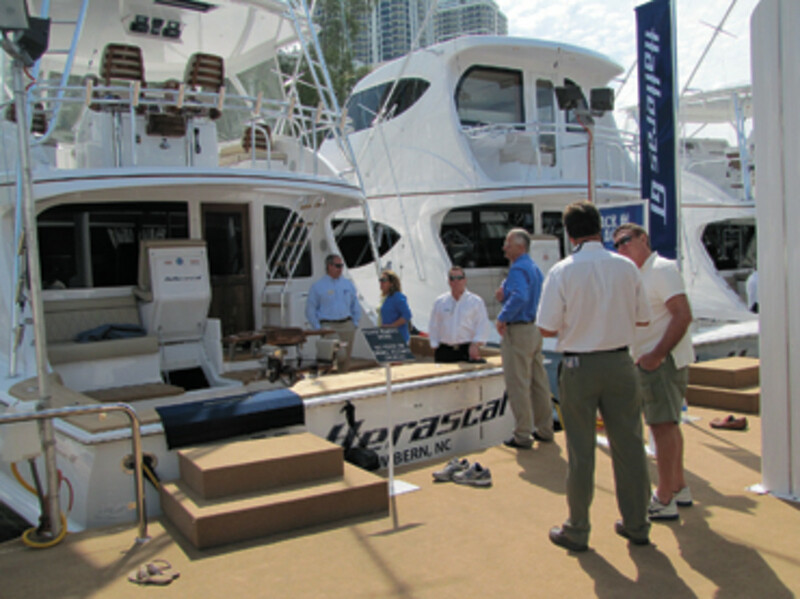 Viking’s sales success followed a VIP preview Feb. 1-2 in Riviera Beach, where 10 boats were sold. “When you go to a show and people are knocked out by what they see it just makes you feel really good. We’re just very elated,” Frederiksen says. Grand Banks Yachts saw traffic registration increase 15 percent, whereas last year it was flat or slightly down from 2011, says brand and marketing director David Hensel. Last year Grand Banks didn’t take any orders during the show, which is “not particularly unusual. We can have a great show and not take any orders,” Hensel says. This year, the builder took an order for a 50 Eastbay SX, and there was significant interest in other Grand Banks models, including the 43 and 54 Heritage EU. Parties at the Yacht & Brokerage Show often occur after dark on the yachts. 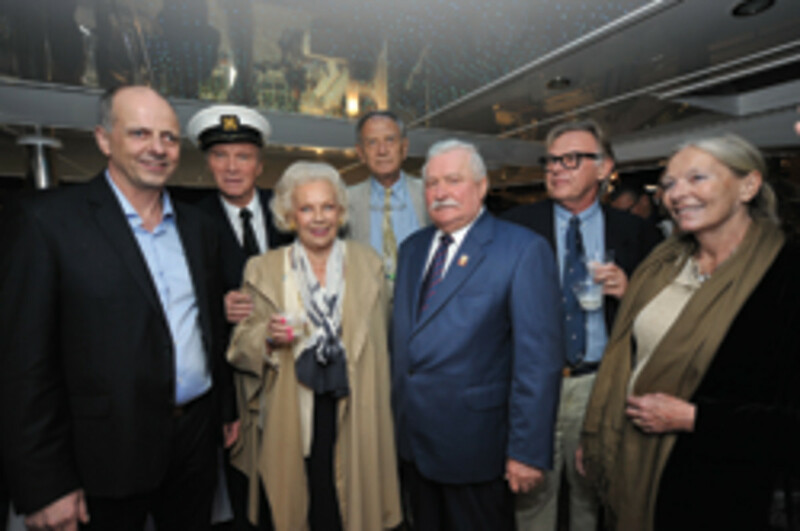 The Sunreef Yachts party that featured Nobel Peace Prize winner and former Poland president Lech Walesa, whose political career grew out of his job at what is now the Sunreef boatyard in Gdansk.